Jaromir Jagr of the Czech Rebuplic takes the puck up ice during the 2010 Winter Olympic games in Vancouver. Ever since the Winter Olympics have started people have been wondering if future Hall of Fame player Jaromir Jagr will return to the NHL. Currently Jagr is playing in Russia for Avangard Omsk of the Kontinental Hockey League (KHL) and is also playing for the Czech Republic in the 2010 Winter Olympics in Vancouver. A popular question that Jagr has been asked is about whether or not he will be returning to the NHL next season. He has proven so far at the Winter Olympics that he can still play with the NHL superstars. Jagr has 3 points in 3 games for the Czech’s. He is definitely thinking about playing in the NHL again. No one knows what is going to happen except for Jagr himself but he is not ready to make his decision quite yet. His contract with Omsk is a two year deal and an option for a third year if he decides to stay. From what it seems like, Jagr is going to deny that option and attempt to make a return to the NHL. Jagr is an 18-year veteran and began his NHL career with the Pittsburgh Penguins. While there he won a Stanley Cup. He has also played for the Washington Capitals and the New York Ranger, his last team before heading over seas. He has 1,599 points in 1,273 NHL games, which are very impressive numbers. 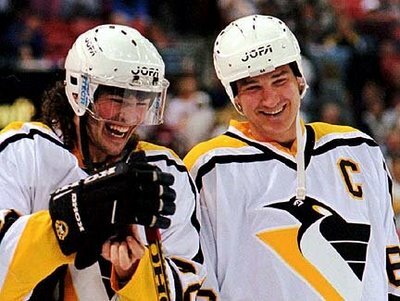 Jaromir Jagr (left) sporting his famous mullet with legendary Pittsburgh Penguin teammate Mario Lemuiex (right). While playing for the Rangers Jagr was slowed down by injuries, and said that “the rigors of the 82 game season had worn on him.” Reports have been saying that Jagr is healthy again, which will be important since after all he will be a 39-year old free agent. A return for Jagr in the NHL would be great. The fans here love him and he has excelled in the league before. He can help out any cup contender, that is if he is willing to take a pay cut. A return to the Pittsburgh Penguins would be ideal so he could retire there and possibly playing with Sidney Crosby or Evgeni Malkin. The Edmonton Oilers were known to have made the best offer before Jagr went to Russia, and are most likely going to take a shot at obtaining him. If Jagr did not want to play for them two years ago, I doubt he will now because they have not improved since then. If Jagr continues his good play at the Winter Olympics then he could see a lot of offers knocking at his door. Maybe even an earlier return than expected because the KHL season ends before the NHL season. I would not be surprised if Jagr is back in an NHL sweater next season.